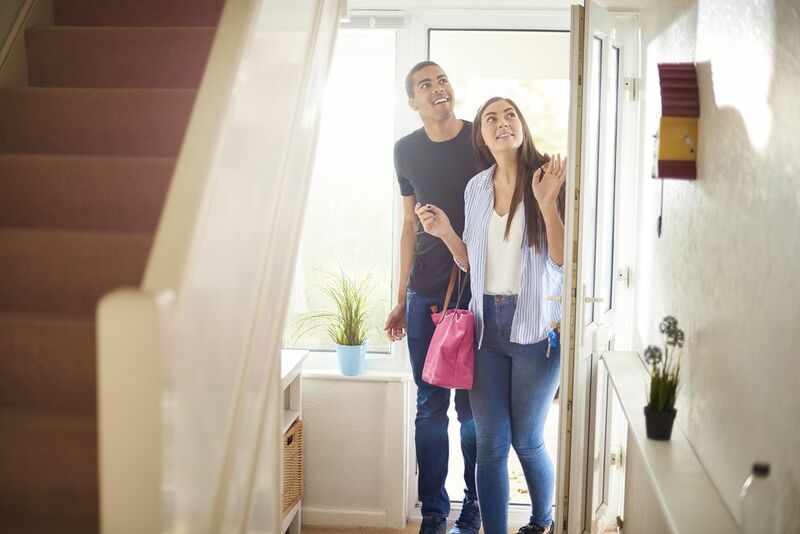 If you live in your home as you try to sell it, the chances are that the foyer is used as a staging area. It is the place where people leave items as they enter the house (like ​mail and groceries) and the room where your family forgets to come back and get their belongings. Before you buy pricey organizational items, assess what you need to make your foyer look welcoming and organized. Donate items such as furniture that is too large or outdated. Next, buy only the necessary organizational items such as baskets, cubbies, install hooks and shelves where there is room. Some families have individual organizers for each member, but these can clutter a small foyer. If the place is filled with shoes, get low shelving; if coats and backpacks are the culprits, get a coat rack or hooks. Remember that you are organizing the space for buyers and not for your family. A foyer table can transform the look of your entry and create a multifunctional aspect to the room. It’s not only stylish; it can personalize a room and make it comfy and inviting. Your small foyer can benefit from a console table with storage. A foyer table does not need to be big and lavish. A simple and elegant one works well for small spaces. It adds organization and display usefulness in busy family areas. Foyer tables range from traditional to modern and come in different accents such as wood, wrought iron, glass, and even marble. You will easily find the perfect one for your home. If you want to impress home buyers, get a unique table with an enchanting design. It will be a wonderful conversation piece because of its playful approach to the interior. An entryway bench serves different purposes. It can function as a place to remove and put on shoes, a storage area, or a décor object. A bench with storage adds additional organization to the entryway. It softens the foyer and creates a welcoming entry for guests. If your space is too small for an entryway bench, get a console table and two ottomans. Place the Ottomans on each side of the table. Potential buyers can sit on them when they come for showings. When choosing entryway furniture, think about the decorative style you would like to show off. If comfort is what you want, add a cushioned bench and some woven baskets for storage. If your home is glamorous, add a mirrored console to set the tone for the house. To add vibrancy to your space, place a piece of painted furniture. Natural lighting is important during the daytime for a welcoming foyer while a well-lit for with artificial lighting at night is essential for nighttime showings. Good lighting makes a foyer safe as buyers can see the interior as soon as they walk in the door. Great lighting will also make sure buyers don’t fumble in the dark for their belongings. 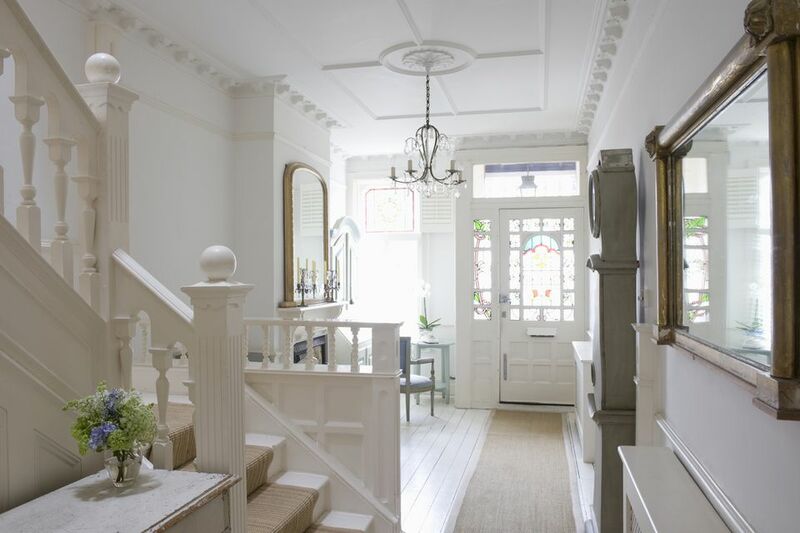 Light fixtures make a foyer look bigger, add personality, and set off an entryway. If your foyer is small and you can’t add overhead lighting, add table lamps or sconces. Pick energy-efficient bulbs as they will last longer. Assess what changes your foyer needs. Often your entryway needs more work than decorating. If you can afford it, add a built-in closet, change the flooring, or build a half wall. Talk to an expert to determine whether the entry closet will look good with doors or without. A contractor can also help you to review your wants and needs. Before moving walls or replacing the flooring, make sure you get a professional opinion regarding what you can accomplish with your budget. A lovely foyer tells home buyers, “Come in! Stay awhile.” But not every homeowner has such a foyer. If your small foyer needs dressing up, implement these staging tips. You’ll be sure to wow every buyer.